"She is an unknown commodity." "How can a woman with five children, one just born four months ago with Downs Syndrome, find time to be the vice president?" "Palin was only picked to be the token woman to take away the angry Hillary voters from Obama." "Sarah Palin is the hot librarian guys fantasized about in school." "Sarah Palin is a right-wing, pro-life, gun-totting nut!" "Sarah Palin has no experience." Many of these comments are true to some extent; however, her critics seem to be leaving out a few facts. While she might have limited experience in some areas, Palin does seem to have other good qualities that I am feeling. Mind you, this doesn't mean I will be voting Republican in November, but there is something about Palin that strikes me. But what interests me the most about her, and that the media is negating to mention, is that Palin seems to be someone who wants to reform the system, even at the expense of upsetting her own party. corruption) had lifetime tenure in the senior post. oil companies. The probe resulted in a $12,000 fine for the party chair. ceded control of Congress to the Democrats. Now, inspite of her pending impeachment charges, reading this alone sounds impressive. 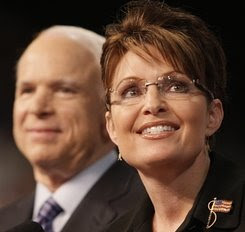 But here's the real question: If McCain is elected, would Palin continue to be a reformer, or would she be sucked into the cesspool of Washington's business as usual policy? If the former is true, than that is REALLY change I can believe in!